you must know the phone box at carnduncan? 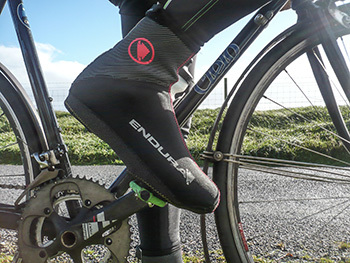 it has been immortalised in the pages of graeme obree's training manual, though if memory serves, it is incorrectly captioned as being on jura. rurality has not suffered the same set of iniquities as the mainland; we still have one or two original red phone boxes dotted about the locality where the new trendy, polished-steel-but-with-no-front-door versions simply won't cut the mustard. or any other condiment for that matter. carnduncan is an occupied and recently refurbished amalagmation of cottages overlooking loch gorm on islay's west coast. if it weren't for the curvature of the globe and less than perfect eyesight, on a clear day the occupants would be able to see the eastern seaboard of canada. as to the phone box, after years of wishing i'd have a legitimate excuse to make use of it (you did remember i don't own a mobile phone, right?) when the opportunity arrived, the darned thing didn't work. its money box was so full, it refused to accept any inserted coins. and on a dark, rainy and windy night, i could really have done with it to be operational. for those who enjoy these tales of hebridean rusticity, i'd to drive four miles to the rspb reserve at aoradh to find another public telephone that also didn't work. ride downhill to the first bend on the loch gorm road and reaching off to the right is a gravel track that once led to a stone cottage. that, like so many former dwellings about the island, is now a ruin. this gravel track heads uphill, meaning that under heavy precipitation, rainwater runs down the track, fills up the shallow ditch at the bottom and spills out onto the road. from now until next march, it will probably do so quite frequently. under really heavy rain, it would not be the first time a passing car has become stuck due to the engine flooding. it's a deep, wet walk back to carnduncan, or even the phone box to call for help. what about using a mobile phone for that purpose? don't be naive; phone reception that far west? i was out that way on saturday, and probably would also have been on sunday had our substantially enlarged peloton not decided on an alternative route. the road had also been flooded at springbank, midway between bowmore and bridgend, admittedly mostly on the inward side of the road, rather than the half on which i was riding. still, naked footwear would not have been the best option. i sort of knew the loch gorm road was likely to have flooded; flowing water across the road at springbank, i have learned, would generally point to that. but because the deepest part tends to occur past the apex of the corner and it's too good a downhill to clutch the brakes, not only can the water reach well towards the wheel hubs, but the rush of speed causes a smidgeon of unwarranted spray. once more, naked footwear is hardly order of the day. 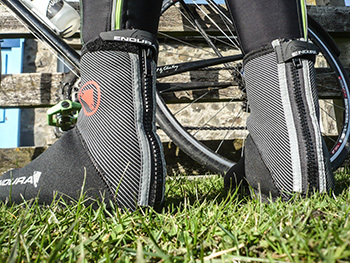 i cannot deny that the temperature, while cool, was never likely to lead to ice or snow, so wearing a pair of endura's latest freezing point overshoes may have seemed to lean just a bit too far towards overkill. but you know what? i couldn't give a monkeys. 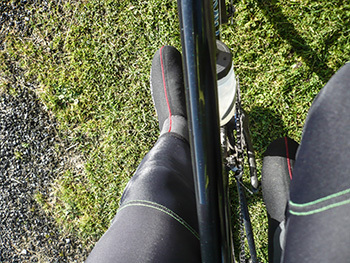 these are the finest pair of waterproof overshoes my happy feet have ever had the pleasure of inhabiting. the freezing point bit is engendered by a thick fleecy lining which cleverly wraps all the way round to velcro in place on the inner face of the outward facing panel. 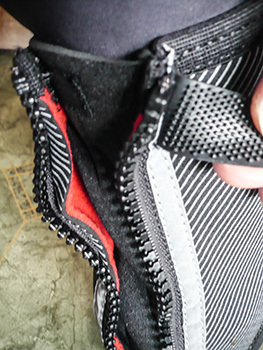 the bottom to top zip than holds everything together before closing a second velcro flap across the outer edge. 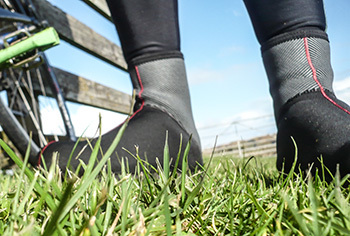 all seams are fully taped and the sole section surrounding the holes for cleat and heel looks more likely to wear tarmac to a smooth finish rather than vice versa. so what of their implied thermal properties? as i previewed, the temperature last week would hardly have fostered a grab for some clean t-shirts, it certainly wouldn't have been used as the backdrop for a christmas movie. however, it was cool enough to force me into bib-threequarters and the first of the season's softshells. 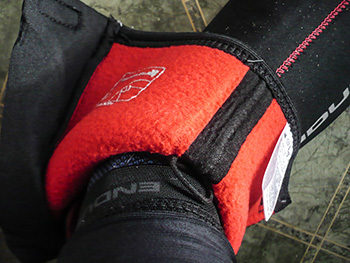 both feet were warmly cossetted, but never to the point of overheating, not an entirely expected result given the outer layer of thick neoprene. my attempts at photography demonstrating their superb ability to slough off even vast quantities of water all came to nought. so effective is the outer neoprene fabric, that i couldn't even get them to look wet, never mind depict them with droplets of water baubling on the surface. that will never get old. at the risk of predicting the future, i see every likelihood that if there's even a hint of precipitation, these will be the essential 'garb du jour' for my feet. at an advised retail price of £39.99, i strongly recommend you do the same. 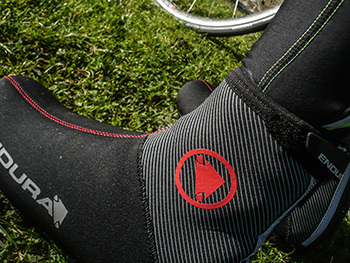 as mentioned on a previous endura product "if you think the spring classics are bad, try scotland."